I’m on a recipe-writing roll, my friends. I guess I’m just so inspired after attending the Healthy Living Summit last weekend! This one in particular is definitely a keeper. Super quick, super easy, and super flavorful (and I dare you to say that the name isn’t cute, too!) I’m going to go ahead and say it’s… super? No, in all seriousness, this is a perfect meal to whip up for yourself if you’re craving a fast, elegant meal without spending hours in the kitchen. And with no chopping, no dicing, and only one-pan to clean up, this dish is pretty much a weeknight’s dream. With such a short ingredient list and easy measurements, doubling, tripling, or octupling the recipe for date night or a dinner party is a breeze. I accept thank yous in email, card, and cash form. 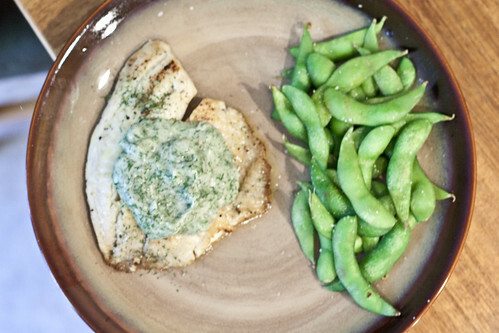 This zesty, flavorful dish can be thrown together in 10 minutes – perfect for a healthy end to a long day’s work! Pair with brown rice and steamed veggies, or a nice hearty salad (do as I say, not as I do, haha.) Not a seafood fan? This punchy flavor combination would be great with chicken too! 1. Heat the EVOO in a pan to medium heat. Season the tilapia filet with half of the lemon juice, salt and pepper right before cooking (if left too long before cooking, the lemon juice will start to cook the fish!) 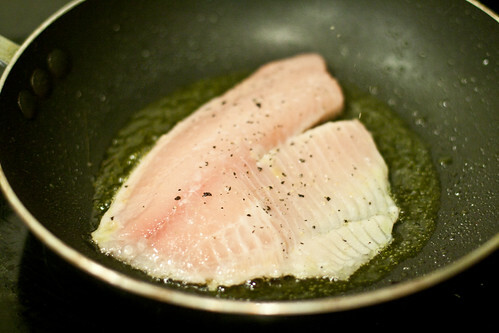 Place in pan and cook for approximately 2 minutes on each side (only turn once), or until fish flakes apart easily. 2. Whisk together the rest of the lemon juice, mayonnaise, dried dill, garlic powder, and additional salt & pepper in a small bowl. 3. Top with sauce and another sprinkle of dill before serving. Bon appetit! And those stats include all of the oil (not all will be absorbed) and all of the sauce (you won’t need to use it all.) That being said, if you’re looking to scrimp on even more calories, you can simply use non-stick spray instead of oil and/or experiment with using plain greek yogurt instead of mayo for the sauce. My one recommendation there is that because the yogurt is tart already, you probably don’t need to use as much lemon juice. I would have tried it myself, but I didn’t have any on hand. And you know how I feel about grocery shopping, haha. Let me know how it turns out if you try! You’re so welcome! Please do — and if you experiment with it at all, let me know. 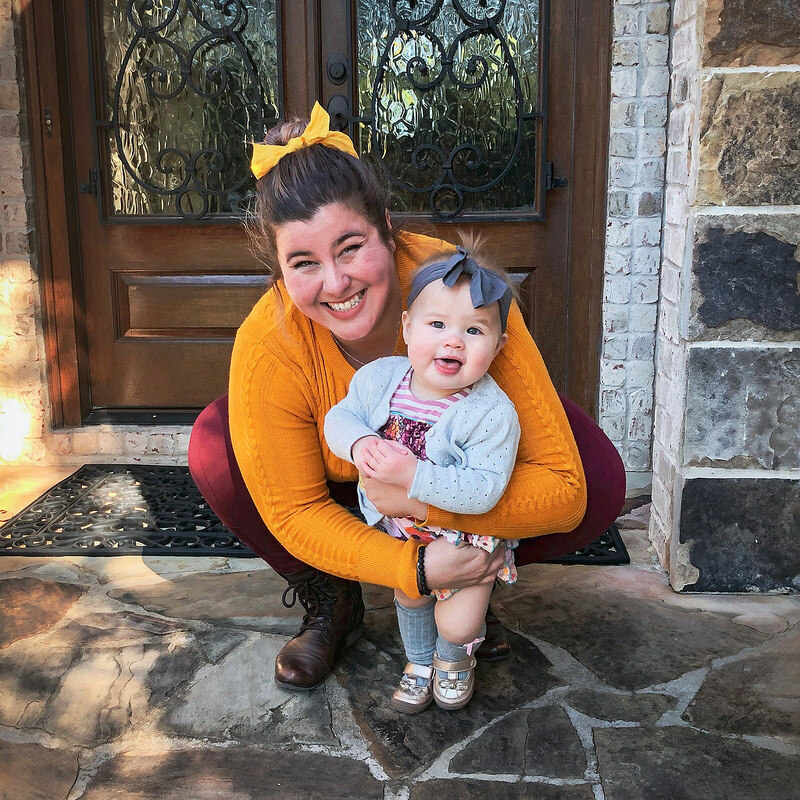 I love hearing about new variations to try! I don’t make it that much at home either, to be honest, even though it’s soooooo good. This pretty much the same as the way you already make it, just with a little bit of a fancy topper. Win-win! It looks great. I am *trying* to eat more fish, but the boyfriend doesn’t care for it. As I don’t really have the time or inclination to make two separate dinners, I’m not doing so well on that goal. However, this looks great. I love dill! Thank you for doing the nutrition stats! I love that! 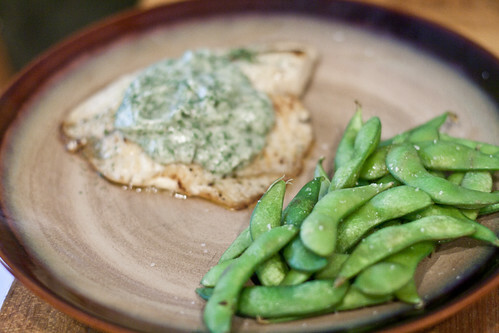 This looks good and I have some Tilapia to use up too! I love this recipe! Dill is fantastic, and I never knew it until recently. I like dill on eggs too! Mmm, deviled eggs with dill! I think I’m going to have to try to create that soon… Great idea!! This looks great!! 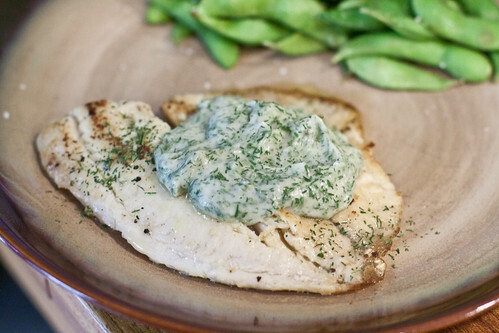 I love tilapia and have been searching for a recipe to try. My search is over, thanks Gretchen!! That looks great. 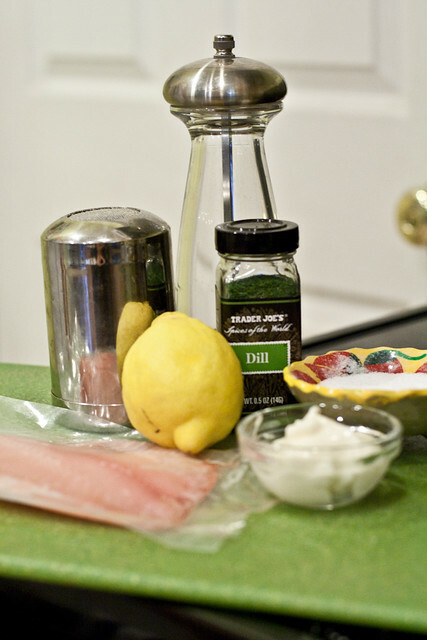 I cook tilapia a lot and have used dill and lemon…I have also done lemon and capers which is good too. I have never tried it with a sauce…I’ll have to try it! Yum that sounds wonderful! I love recipes that can be ready in 15 minutes or less — makes for an awesome weeknight meal like you say! What a great looking dish- and great recipe writing 🙂 I had this amazing dill creme sauce on some gnocchi on Sunday night at Table 52 so i’m totally on the dill train! Look at you go! Nutrition facts, yay! 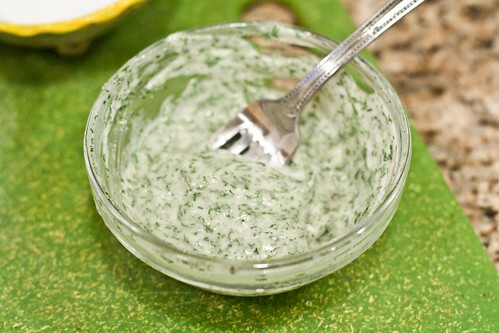 If you’re still on a dill kick, you might like this salmon and shallot vinaigrette from Real Simple (http://www.realsimple.com/food-recipes/browse-all-recipes/salmon-zucchini-shallot-vinaigrette-00000000040174/index.html). It’s not as quick, but it is really good and pretty easy. When I made it, it was my first time using a grill. Ever. Seriously. You had wayy too much fun with that title missy! I’m a sucker for anything with dill in it! My newest obsession is dill topped eggs. Mmm this looks and sounds great! I LOVE lemon. Have you also thought about making ceviches? Everything’s raw, so it can’t get healthier than that (I’m referring more to the vegetables and herbs). We make Tilapia ceviche.